Obama’s vocal support for Kelly is not the contradiction it may have seemed. While stop-and-frisk and Muslim surveillance are hallmarks of the Kelly decade in New York, Obama has built a presidency of ever-expanding executive power and secrecy—a powerful brew that has regularized racial profiling on a sweeping scale. Kelly’s policing of New York bears an eerie resemblance to Obama’s national law enforcement record. Under Kelly, the NYPD has stop-and-frisked a record number of people, reaching an all-time high in 2011 of 685,724 stops (in contrast to fewer than 100,000 in 2002). Of those stopped, 84 percent in 2011 were black and Latino. While the department claims that stop-and-frisk is a tool for crime-fighting and public safety, only 2 percent of stops resulted in the discovery of contraband, and only 6 percent resulted in arrests. Kelly made clear in defending the program to state officials that his purpose is to instill in African-American and Latino communities a deep fear and vulnerability when it comes to the police. The stop-and-frisk policy sends a message to New York City’s communities of color, young men in particular: you are all suspects, and there is no place you should feel safe. Obama’s record bears an uncomfortable similarity to Kelly’s. Over the past five years, Obama’s administration has expanded the footprint of racialized and unchecked criminal justice, similarly under the guise of prevention and security. Though he claimed in the press room that “law enforcement is traditionally done at the state and local levels, not at the federal levels,” Obama’s presidency has been marked by the expanded use of federal power and prosecutorial overreach. In the name of national security, Obama’s DOJ has further inflated the parameters for FBI intelligence gathering. Drawing on the FBI’s continued reliance on its own radicalization report, the bureau under Obama has increased emphasis on surveillance and “sting” operations in Muslim communities. The Senate confirmation earlier this week of Obama’s choice of FBI Director James Comey promises more of the same. Obama’s DOJ attributes a disproportionate, stereotyping sense of dangerousness to Muslim defendants, regularly subjecting them to prolonged solitary confinement and sensory deprivation pre-trial, to special prisons like the Communication Management Units in Terre Haute and Marion and to a disproportionate housing in the nation’s federal Supermax units. The combined “War on Terror”/War on Drugs continues to send more and more people into federal prisons, disproportionately people of color, with more and more torturous conditions; while national attention has focused on the California hunger strike and the inhumane conditions there, more than 12,000 people are held in solitary confinement in federal prisons alone. Obama has carved out his executive power against new horizons, entrenching the legal phenomenon from which racial stigma is borne. His Department of Homeland Security has deported record numbers of individuals—409,849 people in 2012 alone, with a projected 2 million total by 2014—and detains a record-breaking 400,000 immigrants annually in an archipelago of 250 jails and detention centers nationwide. Secure Communities forces local police to collaborate in enforcing federal immigration law, all but inviting police officers to intensify racial profiling. Equally breathtaking, just last week, the Obama administration again claimed for itself in federal court the right to have targeted and killed three (Muslim) American citizens, without any judicial oversight or even jurisdiction. The message sent to immigrants, to Muslims, to people of color: you are all suspects, and there is no place you should feel safe. Obama’s seduction of the American public lies in his ability to sound the notes of racial justice and the quest for equality at key moments, while at the same time asserting unprecedented executive and federal power and giving the nod to those like Ray Kelly who actively support a differential justice system for people of color. 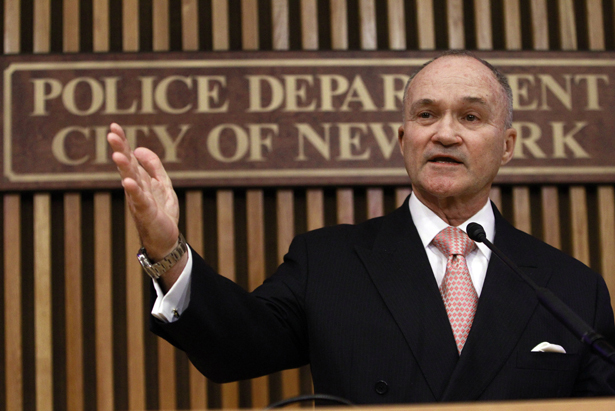 Ray Kelly says he’s “flattered.” We should not be so easily charmed. Amna AkbarAmna Akbar is Visiting Assistant Professor at The Ohio State University, Moritz College of Law. Her writing and lawyering focus on the intersections of national security, criminal justice, and immigration enforcement.